As far as Opening Day goes, you can’t have a better one than the Yankees had. Last year’s Opening Day win in Toronto was the gold standard for Opening Day wins and Thursday’s at least matched it. The good Masahiro Tanaka showed up, something which hasn’t always happened in his Opening Day starts, in place of Luis Severino, the Yankees’ offense was overpowering, even without their starting center fielder and best leadoff option not named Aaron Judge and the bullpen pieced together 3 1/3 scoreless innings without Dellin Betances. The win was a product of the formula the Yankees have tried to win a championship with the last couple seasons: home runs get the lead, starting pitcher goes at least five and the bullpen closes it out. The formula has come up short in back-to-back postseasons for the Yankees, but the way everyone talked about signs pointing to it being the Red Sox’ year early last season when they got off to a 17-2 start and won games every which way, there were a few small signs in Thursday’s 7-2 win over the Orioles pointing to this possibly being the Yankees’ season. When things like Judge and Giancarlo hitting back-to-back singles and Gary Sanchez is squibbing ground balls through the shift happen, you can’t help but think, This is the Yankees’ year. Big picture, it was one win over the lousy Orioles, a team the Yankees shouldn’t lose to once out of their 19 games this season and a team who would probably sign up for their 47 wins from last season right now. (I have no idea how their roster is going to come up with one win let alone 47 and we might be looking at the worst team in the history of Major League Baseball.) But when you have been baseball-deprived for nearly six months and your season ends the way the Yankees’ did last year, Opening Day always feels more important and significant than it should. 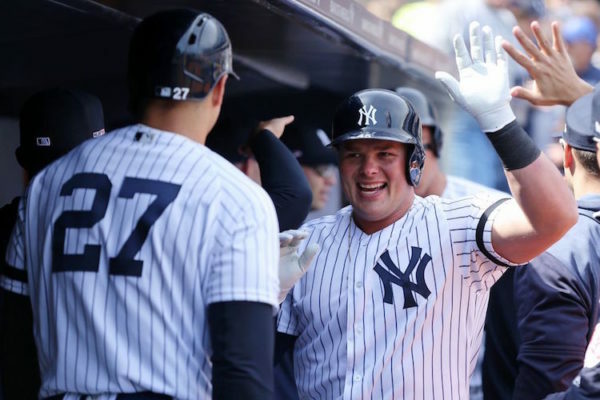 We already knew the Yankees were on the short list of potential American League champions with the Red Sox and Astros, and Thursday did nothing other than prove they should be able to beat up on the many tanking teams in this year’s AL. With two more games against Baltimore this weekend, followed by three against Detroit and another three with Baltimore next weekend, there’s no reason the Yankees can’t go at least 7-2 in those nine games. They have to go to at least 7-2 in those games. The difference between winning the division and playing in the wild-card game last year came down to the Yankees’ inability to rack up wins against the crap throughout the league (and the four game sweep in Boston didn’t help). There will be plenty of time to worry about the Yankees’ postseason plans and how they will navigate through the Red Sox and Astros in October. For now, the Yankees’ first goal is to win the division, something they haven’t done in seven years. Thursday’s win got them started in the right direction.